What is a feature common to both the small, landlocked west African country of Burkina Faso and southwestern Arizona? Personal experience of living in both places suggests at least this one: There comes to both a season in which the heat is so dry and intense that the whole great out-of-doors feels like one big sauna. When these climatic conditions prevail, cooking that requires extended oven use is to be avoided whenever possible. 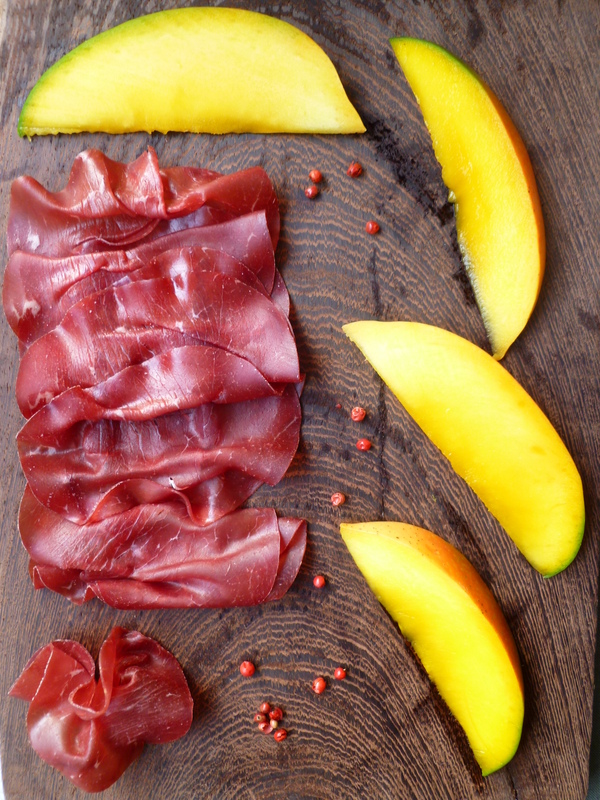 The mango and thin-sliced, air-dried and salted beef Bresaola (from the Alps of northern Italy) that are the principal component parts of this entrée (aka first course) will raise the kitchen’s temperature not one iota. 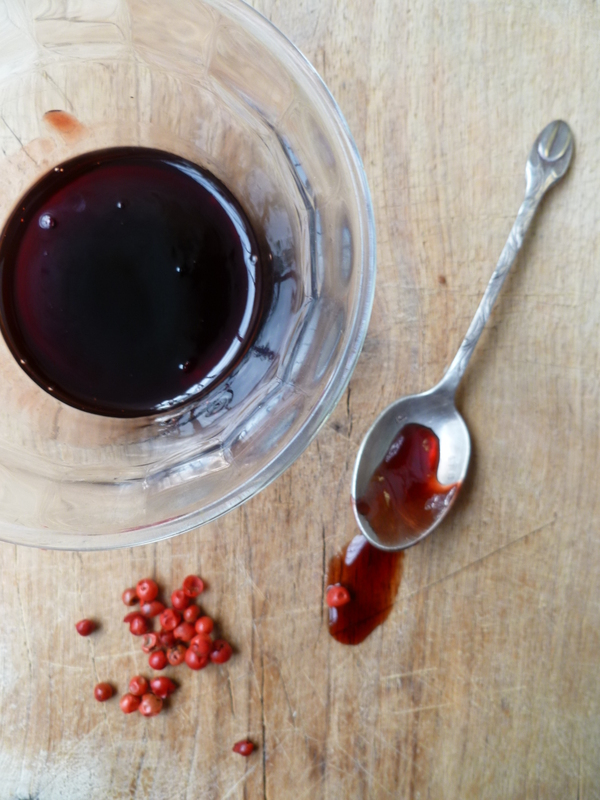 The only heat applied in the making is during the few brief minutes in which the sauce caramelises over a burner flame. 4 large Mangoes or enough from which to cut 24 slices…4 for each plate. 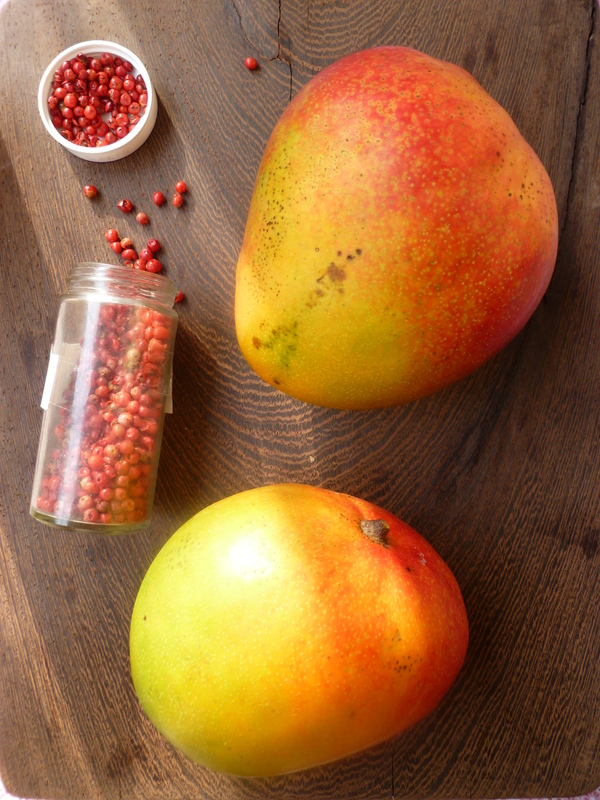 A suggestion: Large mangoes may look good on the outside, but when cut (much to the buyer’s dismay) may reveal sections of spoiled fruit. It is well to buy an extra one…just in case. If using small or medium mangoes, increase the number of slices per entrée to six. 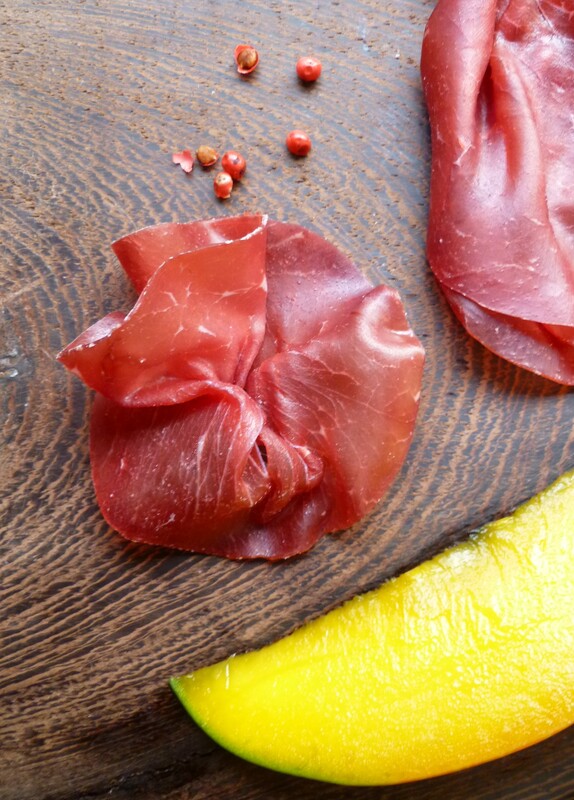 18 slices of Bresaola: Slices of the Swiss air-dried beef Bündnerfleisch or Viande des Grisons are an excellent substitute. Thin slices of smoked duck are another good alternative. 1. Peel the mangoes and cut them into long, thin slices…there should be at least 4 slices (cut from large mangoes) for each individual entrée. 2. In the pan, whisk together the wine and powdered sugar. 4. 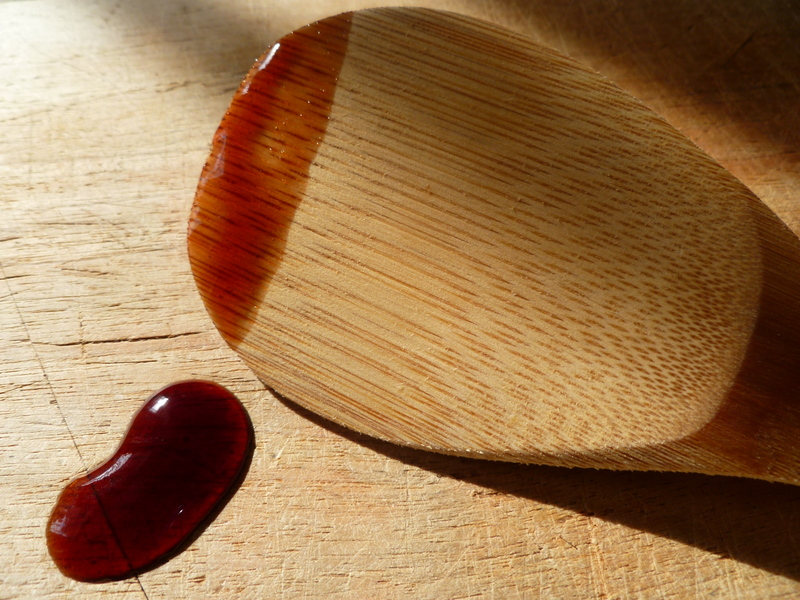 Stir the balsamic vinegar into the sauce. 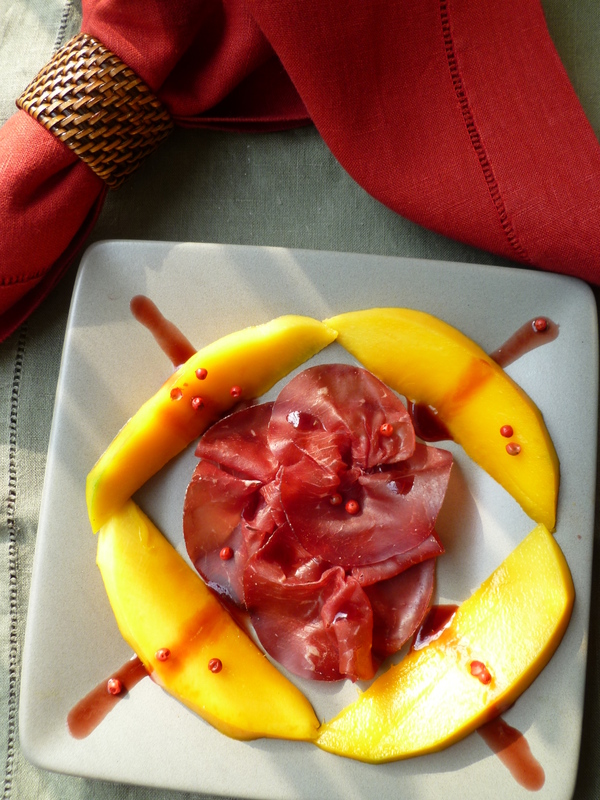 Transfer the sauce to a small bowl and set it aside while you arrange mango Bresaola on the plates. 6. 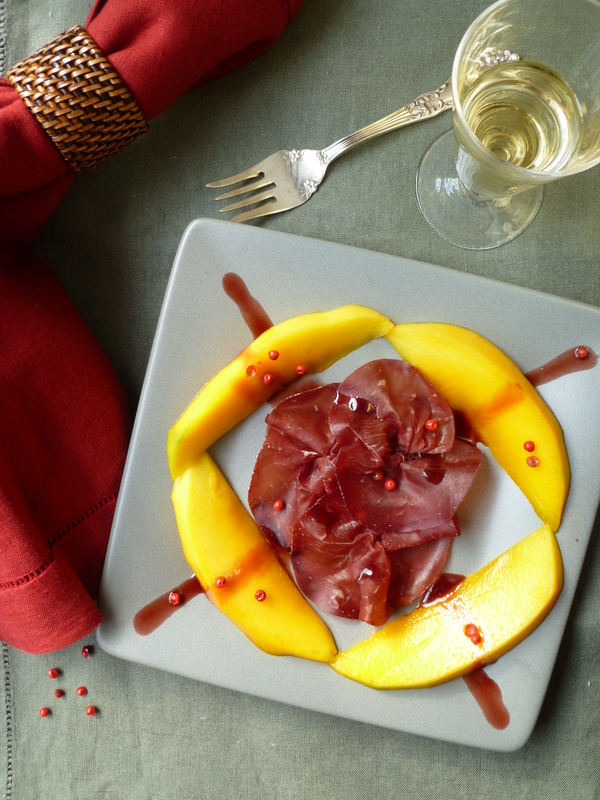 Arrange 3 Bresaola rosettes in the center of each plate and encircle them with 4 mango slices. 7. Dribble ribbons of sauce, extending out , like the sun’s rays, over the mango slices and out to the corners of each plate. 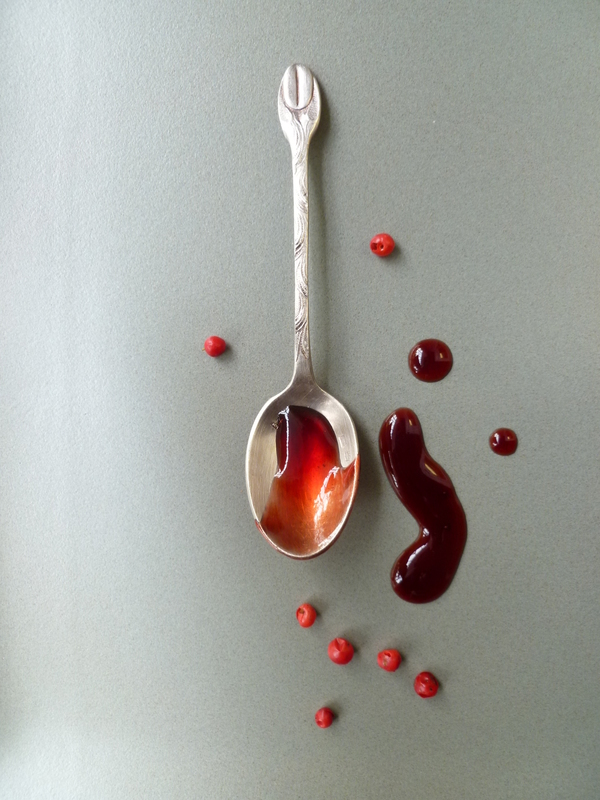 Dot the plates here and there with droplets of sauce and sprinkle each entrée with about 1 teaspoon of pink peppercorns. 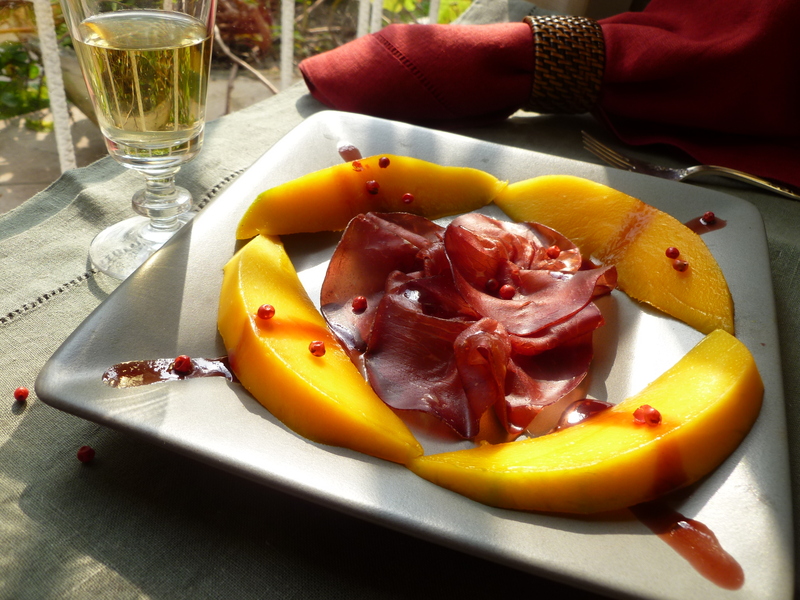 A Note: Mango and Bresaola with Caramelised Red Wine Sauce is the First Course of the Lunch Menu: A Lunch with Spice and Many Things Nice.